1 A None No Power Seat 1 A is a Business Class Bulkhead seat that may have restricted legroom due to the proximity of the Bulkhead. The close proximity to the galleys and lavatory may be bothersome as well. The middle seats are blocked to allow for more room for the Business Class passengers in this seat. The tray table is in the armrest, making the armrest immovable and slightly reducing seat width. There may be no floor storage during take-off and landing. 1 C None No Power Seat 1 C is a Business Class Bulkhead seat that may have restricted legroom due to the proximity of the Bulkhead. The close proximity to the galleys and lavatory may be bothersome as well. The middle seats are blocked to allow for more room for the Business Class passengers in this seat. The tray table is in the armrest, making the armrest immovable and slightly reducing seat width. There may be no floor storage during take-off and landing. 11 A None No Power Seat 11 A is an Economy Class Exit Row seat that may have extra legroom. However this seat may also have limited recline due to the Exit Row behind. The tray table is in the armrest, making the armrest immovable and slightly reducing seat width. There may be no floor storage during take-off and landing. 11 B None No Power Seat 11 B is an Economy Class Exit Row seat that may have extra legroom. However this seat may also have limited recline due to the Exit Row behind. The tray table is in the armrest, making the armrest immovable and slightly reducing seat width. There may be no floor storage during take-off and landing. 11 C None No Power Seat 11 C is an Economy Class Exit Row seat that may have extra legroom. However this seat may also have limited recline due to the Exit Row behind. The tray table is in the armrest, making the armrest immovable and slightly reducing seat width. There may be no floor storage during take-off and landing. 11 D None No Power Seat 11 D is an Economy Class Exit Row seat that may have extra legroom. However this seat may also have limited recline due to the Exit Row behind. The tray table is in the armrest, making the armrest immovable and slightly reducing seat width. There may be no floor storage during take-off and landing. 11 E None No Power Seat 11 E is an Economy Class Exit Row seat that may have extra legroom. However this seat may also have limited recline due to the Exit Row behind. The tray table is in the armrest, making the armrest immovable and slightly reducing seat width. There may be no floor storage during take-off and landing. 11 F None No Power Seat 11 F is an Economy Class Exit Row seat that may have extra legroom. However this seat may also have limited recline due to the Exit Row behind. The tray table is in the armrest, making the armrest immovable and slightly reducing seat width. There may be no floor storage during take-off and landing. 12 A None No Power Seat 12 A is an Economy Class Exit Row seat that may have extra legroom. The tray table is in the armrest, making the armrest immovable and slightly reducing seat width. There is no floor storage during take-off and landing. 12 B None No Power Seat 12 B is an Economy Class Exit Row seat that may have extra legroom. The tray table is in the armrest, making the armrest immovable and slightly reducing seat width. There is no floor storage during take-off and landing. 12 C None No Power Seat 12 C is an Economy Class Exit Row seat that may have extra legroom. The tray table is in the armrest, making the armrest immovable and slightly reducing seat width. There is no floor storage during take-off and landing. 12 D None No Power Seat 12 D is an Economy Class Exit Row seat that may have extra legroom. The tray table is in the armrest, making the armrest immovable and slightly reducing seat width. There is no floor storage during take-off and landing. 12 E None No Power Seat 12 E is an Economy Class Exit Row seat that may have extra legroom. The tray table is in the armrest, making the armrest immovable and slightly reducing seat width. There is no floor storage during take-off and landing. 12 F None No Power Seat 12 F is an Economy Class Exit Row seat that may have extra legroom. The tray table is in the armrest, making the armrest immovable and slightly reducing seat width. There is no floor storage during take-off and landing. 2 A None No Power Seat 2 A is a standard Business Class seat. All the middle seats are blocked off to allow for more room for the Business Class passengers. 2 C None No Power Seat 2 C is a standard Business Class seat. All the middle seats are blocked off to allow for more room for the Business Class passengers. 2 D None No Power Seat 2 D is a Business Class Bulkhead seat that may have extra legroom. The middle seats are blocked to allow for more room for the Business Class passengers in this seat. The tray table is in the armrest, making the armrest immovable and slightly reducing seat width. There may be no floor storage during take-off and landing. 2 F None No Power Seat 2 F is a Business Class Bulkhead seat that may have extra legroom. The middle seats are blocked to allow for more room for the Business Class passengers in this seat. The tray table is in the armrest, making the armrest immovable and slightly reducing seat width. There may be no floor storage during take-off and landing. 29 C None No Power Seat 29 C is an Economy Class seat where the close proximity to the lavatories behind may be bothersome. 29 D None No Power Seat 29 D is an Economy Class seat where the close proximity to the lavatories behind may be bothersome. 3 A None No Power Seat 3 A is a standard Business Class seat. All the middle seats are blocked off to allow for more room for the Business Class passengers. 3 C None No Power Seat 3 C is a standard Business Class seat. All the middle seats are blocked off to allow for more room for the Business Class passengers. 3 D None No Power Seat 3 D is a standard Business Class seat. All the middle seats are blocked off to allow for more room for the Business Class passengers. 3 F None No Power Seat 3 F is a standard Business Class seat. All the middle seats are blocked off to allow for more room for the Business Class passengers. 30 A None No Power Seat 30 A is an Economy Class seat in the last row of the plane. This seat may have limited recline and the close proximity to the lavatories and galley behind may be bothersome. 30 B None No Power Seat 30 B is an Economy Class seat in the last row of the plane. This seat may have limited recline and the close proximity to the lavatories and galley behind may be bothersome. 30 C None No Power Seat 30 C is an Economy Class seat in the last row of the plane. This seat may have limited recline and the close proximity to the lavatories and galley behind may be bothersome. 30 D None No Power Seat 30 D is an Economy Class seat in the last row of the plane. This seat may have limited recline and the close proximity to the lavatories and galley behind may be bothersome. 30 E None No Power Seat 30 E is an Economy Class seat in the last row of the plane. This seat may have limited recline and the close proximity to the lavatories and galley behind may be bothersome. 30 F None No Power Seat 30 F is an Economy Class seat in the last row of the plane. This seat may have limited recline and the close proximity to the lavatories and galley behind may be bothersome. 4 A None No Power Seat 4 A is a standard Business Class seat. All the middle seats are blocked off to allow for more room for the Business Class passengers. 4 C None No Power Seat 4 C is a standard Business Class seat. All the middle seats are blocked off to allow for more room for the Business Class passengers. 4 D None No Power Seat 4 D is a standard Business Class seat. All the middle seats are blocked off to allow for more room for the Business Class passengers. 4 F None No Power Seat 4 F is a standard Business Class seat. All the middle seats are blocked off to allow for more room for the Business Class passengers. 5 A None No Power Seat 5 A is a standard Business Class seat. All the middle seats are blocked off to allow for more room for the Business Class passengers. 5 C None No Power Seat 5 C is a standard Business Class seat. All the middle seats are blocked off to allow for more room for the Business Class passengers. 5 D None No Power Seat 5 D is a standard Business Class seat. All the middle seats are blocked off to allow for more room for the Business Class passengers. 5 F None No Power Seat 5 F is a standard Business Class seat. All the middle seats are blocked off to allow for more room for the Business Class passengers. 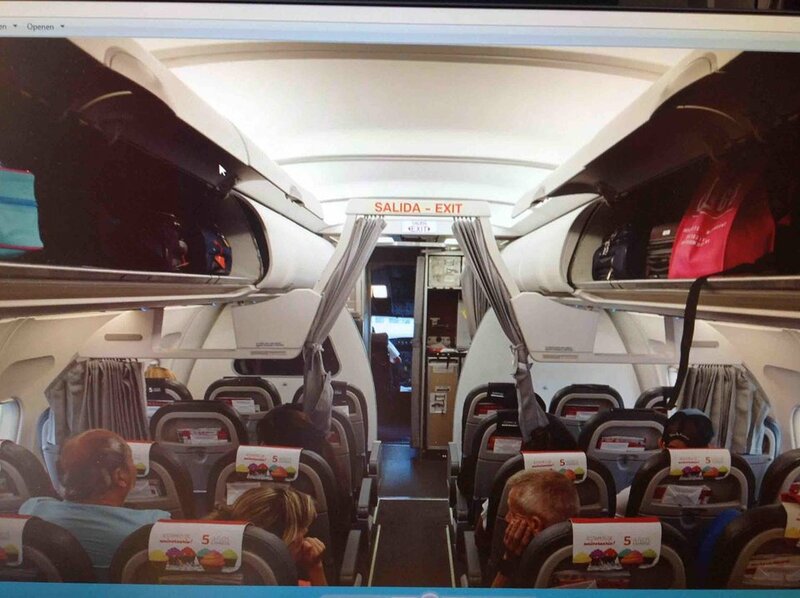 The Business and Economy Class sections can be adjusted according to demand. In Business Class, the middle seat is always left unoccupied on all domestic flights, and flights to Europe, North Africa, and the Near East. Exit row had plenty of legroom which was nice for a medium haul MAD-PRG flight. I was comfortable throughout the flight. Note that EU regulations do not allow floor storage during takeoff and landing in the exit row. The non-exit row seats looked really tight though, and the crew did not turn off the overhead lights even though it was an evening flight; however, they dimmed them on my request. horrible. 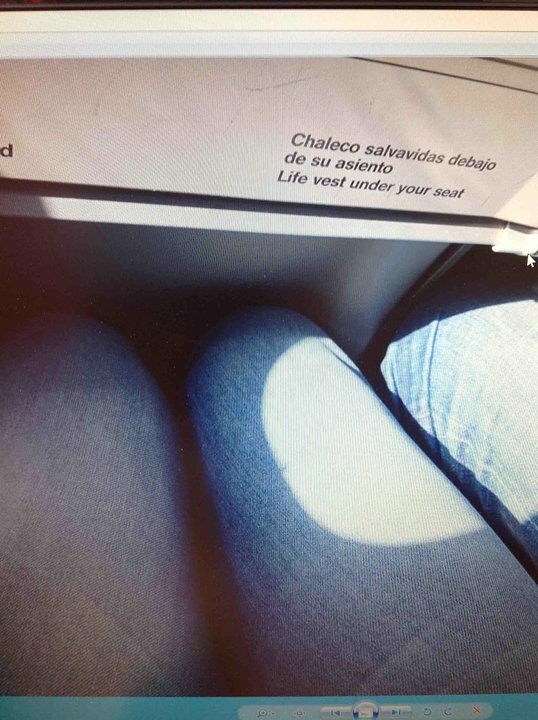 It can´t be considered a seat because there is not enough leg room. It hurts badly and after 3 hours in that plance I have to say it was horrible. For me this is fraud because it´s not a seat what they offer. I am 1.84cm. I usually fly this plane on my LHR-MAD route and is the worst experience ever. There is no legroom. I can see how most of the passengers are showing signs of discomfort. Horrible. The leg space is awful. If you are taller than 180cm and don't get an aisle seat, good luck trying to find some position that doesn't hurt. Holy crap, this must be the smallest legroom in the world?! I am 195cm and it was physically impossible to fit in the seat, especially on the middle seat, with 2 tall guys next to me. How the hell is this even legal?? It is super uncomfortable. Avoid A320 with Iberia or Iberia at all! This is the worst plane and airline of all. There is no legroom at all. It is worst than a cattle truck. Unbelievable Iberia allows this! Flew yesterday BRU - MAD. Seat ok for this short flight. Food was good. I've flown Iberian several times but this time was the singularly worst flight my wife and I have ever experienced. I'm 5ft 9in and my knees were compressed by the seat in front. My wife is only 5ft 2in and she complained about legroom. Frankly this seat configuration is not only tortuous but dangerous. There is no way anyone could exit their seats in an emergency and no way to adopt the head down crash position. DO NOT FLY THESE PEOPLE! 28 inch are not enough.very inconfortable avoid this airline avoid this seat. avoid this plane. The legroom is herredously bad, non existent almost, im over 6'3" and was wedged into a middle seat, MAD-LGW so only two hours, it felt dangerous to have my knees tightly pressed to the seat in front of me, and these seats still have the recline function.!?! ?.I have never felt so cluastraphobic in an aircraft before...if you want comfort avoid this iberia express...their long haul planes however are surprisingly spacious. Madrid-Munich. Worst plane seat ever. There's no normal leg room. An average adult hardly fits in this seat. Due to the airline policy, you have to pay for any pre-reserved seat - 10 in this case - but in their web page there's no warning about the lack of leg room in row 9, which should be less expensive. Avoid IBERIA if you can. Minimal seat pitch. I struggle to understand how the aviation authorities authorize such an unhealthy pitch. I saw several passengers complaining as they did not fit in the seat. The cabin crew was very understanding and tried to accomodate some of the taller passengers. But unfortunately I wasn't one of them and arrived with my legs destroyed. It is also a shame that you pay BA and get Iberia. Avoid Iberia. Worst airplane ever. There is virtually no seat pitch. Even the cheapest of the low cost airlines has a bigger pitch. Avoid Iberia. Probably the most uncomfortable flight I have ever had. The seats are so close together I had to continually move my knees sideways. It was a nightmare. 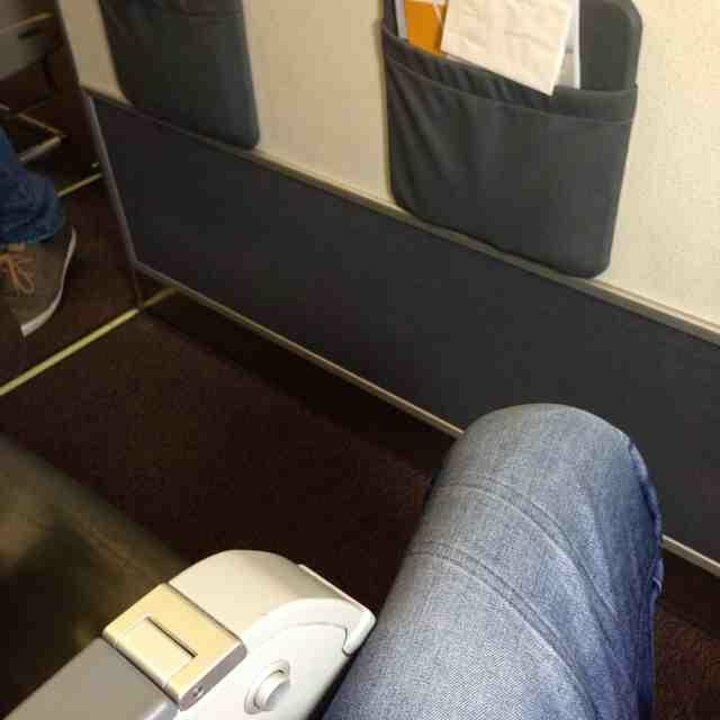 Iberia has possibly the worst seat pitch of any airline in the industry. They say 28 inches which is almost uninhabitable anyway - but they feel even less. It is verging on the unacceptable and dangerous. Fly with another airline. There is no leg room between the seats. I am 192cm tall and it was not easy to fit in the seat during more than 3 hours. 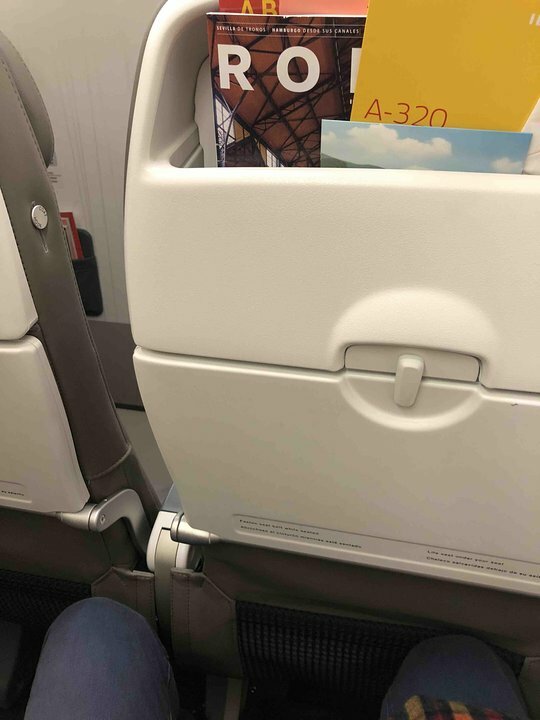 Even though the seats are narrow and that it's a new plane, the space for the legs is very poor. 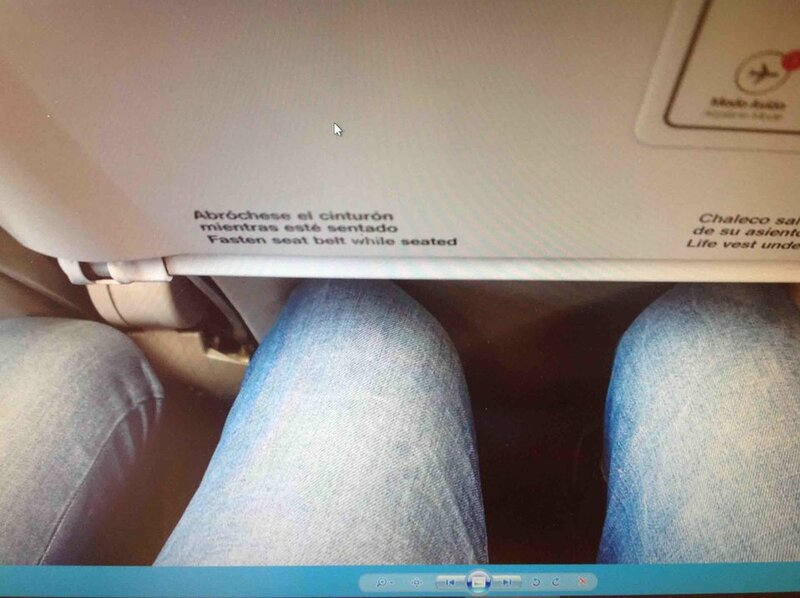 Even to me with 1.76 mts it's imposible to stand for a 3.5 hs flight with my legs hitting the front seat continuously. Choose another seat if you can o another airline. Worst flight ever. My flight from Seville - Bilbao was horrible. The airplane itself was very uncomfortable. I wasnt able to take a rest, seat very hard, aircraft was very noicy and the seat didn't recline as much as other airlines Economy seats. Service has horrible. Iberia staff were very rude and didn't care about us. Flight attendants wont even offer you anything if you are not willing to pay. Food and drinks very expensive and not worth for purchase, better buy something at the airport. Also legroom was extremelly reduced compared to other aircrafts. I've flown a 737-200 in the past and my experience was way much better. More recline, better attendance, more legroom and surprisly, flight was smoother and more quiet. I wouldn't fly Iberia neither an A320 again. I would rather travel by bus than in an A320 and Iberia. There is no leg room in this seat or in any other that I could tell. Luckily, there was no one sitting in the third seat, so my wife and I could turn our legs sideways in the space of 20B.